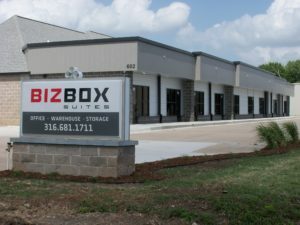 The new BizBox Suites at 602 N. Webb Road is now open and ready for tenants, says Anderson Management’s Ross Way. In fact, he says one Denver-based business already has signed a lease. The 8,000-square-foot building is a converted car wash.
“It sat there for three or four years,” Way says. The suites, which range from 670 square feet to 1,350 square feet, are available for office, warehouse and storage uses. Leases start at $900 a month.